Ariana Grande Sings Broadway Songs with Her Friends - Watch Now! Ariana Grande hosted a Broadway sing-a-long party on Sunday (February 17) and it looked like so much fun! 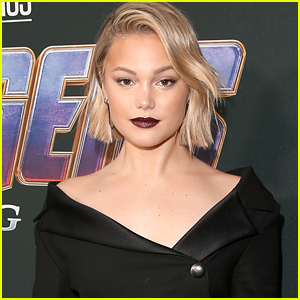 The 25-year-old singer was spotted picking up some groceries at Whole Foods that afternoon in West Hollywood, Calif.
Ari was joined by her co-stars from the Broadway musical 13, Elizabeth Gillies and Graham Phillips, to sing some of their favorite songs. Ari and Liz did a duet of “Take Me Or Leave Me” from Rent while Ari and Graham sang “As Long As You’re Mine” from Wicked. Ariana Grande Debuts at No. 1 With 'thank u, next'! Ariana Grande is totally dominating! The 25-year-old “7 Rings” singer is sitting at the top spot on the Billboard 200 with her latest record, thank u, next, as of Sunday (February 17) according to the official chart company. The album didn’t just hit No. 1: it’s also the biggest week for a pop album in over a year, and the biggest streaming week ever for a pop album, with 360,000 equivalent album units moved in its first week. 116,000 of those units were traditional album sales. Why Are Ariana Grande's Arianators Boycotting '7 Rings'? Ariana Grande fans are so loyal, they’ve created a movement to help her earn even more chart success! Arianators are teaming up to get the 25-year-old thank u, next superstar her third No. 1 hit from her newest studio album. 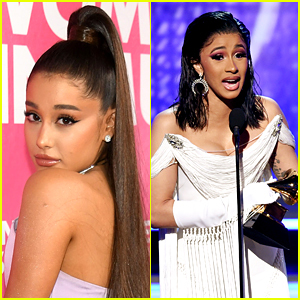 Following the smash success of “thank u, next” and current hit single “7 Rings,” fans are now hoping to get her newest single, “break up with your girlfriend, i’m bored” to the top of the charts – even creating a movement called #BOYCOTT7RINGS just to halt the success of the current reigning hit to make room at the top for the next single. “y’all are so insane and funny and i love u. nothings funnier than ‘boycott seven rings’….. i can’t lmao. whatever’s meant to be will be, babies i ain’t goin nowhere #thankunext,” Ari wrote on Twitter on Wednesday (February 13) when she saw the fan movement. “this is a wild time for us lmao do ur thing but also like how is this our problem rn …… what the f—k,” she added. If you’re wondering why Ariana Grande tweeted the word “trash” while Cardi B was accepting her award at the Grammys, we have your answer. Ariana also tweeted and deleted “literal bulls–t” a minute later. One of the reasons why people initially thought Ariana expressed her feelings was that her late ex-boyfriend Mac Miller was nominated posthumously in the category for his album Swimming. She is also a longtime friend of Nicki Minaj, who famously does not get along with Cardi. Ariana then tweeted, “nothing to do w [Cardi]. good for her. i promise. i’m sorry.” She was actually upset that the Grammys invited Mac‘s family to the event, even though he wasn’t the winner.